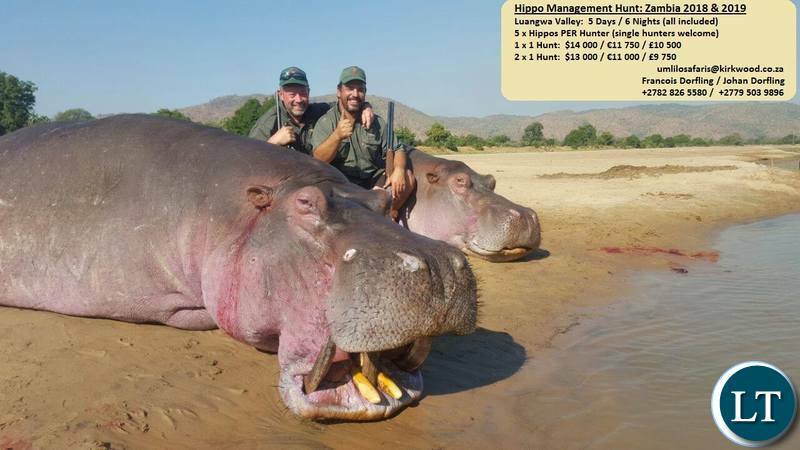 Ministry of Tourism and Arts Permanent Secretary Reverend Howard Sikwela has said the Hippo Culling exercise in the Luangwa Valley will only commence in May 2019 at the start of the hunting season. Speaking this morning during a meeting with representatives of various Community Resource Boards across the country, the Reverend Sikwela said this would be preceded by sensitization of the communities and stakeholders involved in the process for all to appreciate the benefits of the undertaking. He said everyone especially those in Eastern Province, where the activity will be undertaken shall be given an opportunity to have a say, and ask questions where they are not sure concerning the culling activity. Reverend Sikwela said he was, however, happy that many already have an appreciation of the background and benefits of the culling activity. Earlier, National CRBs Association Coordinator, Isaac Banda wondered if the hunting story was a rumor or a confirmed position by the ministry. Mr. Banda said he was concerned that local communities in areas where the culling activity will take place have not been fully engaged to appreciate the benefits of such an undertaking. He said these communities were equal partners with government in the conservation process and hence the need to constantly be kept in the know of what was happening in their surrounding. From Sesheke now to Luangwa valley. These PF leave your friends alone, why you like kill things? Culling is a primitive conservation strategy. This will seriously hurt tourism in Zambia in the long run. Corrupt lazy thieves everywhere they even have religious titles to march…he means that when the official culling will begin they have probably culled hundreds..heis not even ashamed to use that word in this day and age!! They are killing people because of lack of boreholes…most of these people do their laundry by the riverside..that’s like playing with a t-bone in front of a hungry dog. Killing innocent Hippos for monetary gains, in the name of culling, dumb fools. What is the exact Hippo population? I am sure you have no fuc*ing Idea. MAY TO AUGUST IS THE MAIN TOURIST SEASON IN ZAMBIA === MANY TOURISTS FLOCK TO LUANGWA TO ADMIRE OUR BEAUTIFUL WILDLIFE AND GAME PARKS. IF TOURIST ARRIVE AND SEE MASS CULLING OF HIPPOS THEY WILL CERTAINLY LEAVE AND ONCE THEY LEAVE AND SPREAD THE WORD IT WILL DAMAGE ZAMBIA’S REPUTATION FOREVER !!!!!!!!! WITHOUT TOURISTS LODGES WONT’ OPERATE IF LODGES DON’T OPERATE THEN JOBS WILL BE LOST. THIS CULL IS DONE OUT OF GREED AND CORRUPTION. Kill vingwena imwe please. vativuta. kupaya banthu. Leave the hippos. I live in South Luangwa and the idea of culling Hippos in the Luangwa river is a bad one especially without consultation from relevant people especially operators. In 2017, we naturally lost 2000 to 3000 hippos from anthrax the disease which they normally pick from soil when they graze. Looking at the numbers of hippos that died a year ago, the numbers have naturally reduced and there would be no need of culling them again. PLEASE LATE NATURE TAKE IT’S COURSE!! This country is just starting to score big on photographic safaris, lets be careful. Humans always make a mistake in trying to control nature. Who are we to say that there are too many hippos in the river? Besides, there are predators and scavengers that would sort the problem please have regard and respect for these animals. LET NATURE TAKE IT’S COURSE!!!!! Why they want to kill hippo? He harm some one?